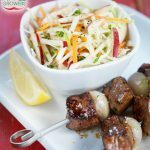 Sweet and juicy pork shoulder sings with the sweet flavour of apple cider and is complemented by a fresh and tangy SweeTango apple slaw! Season pork on all sides with salt and pepper, rest at room temperature for 60 minutes prior to braising. Place pork in a large heavy bottom cast iron pan with tight-fitting lid (braiser). Arrange shallots, apples and garlic around pork, pour hard cider into bottom of pan. Add rosemary to pan. Bring liquid to boil over high heat, cover, and place in oven for 3-4 hours or until knife tender. 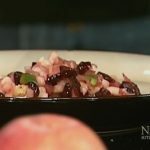 Allow meat to cool slightly in braising liquid, transfer to a cutting board to rest, remove onions and apples to serve. Strain liquid through a fine-mesh sieve into a small saucepan, reduce to desired consistency, reserve. 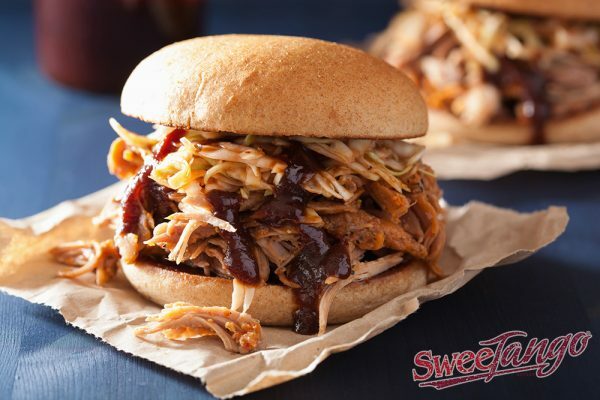 Use a fork to shred the pork, place on toasted bun, spoon braising liquid on top, add coleslaw to finish. In a large mixing bowl, whisk vinegar, honey, mayonnaise, sriracha, mustard, lime zest and juice, celery seeds, salt and pepper. Set aside. Add shredded cabbage, scallions and apples to the bowl, toss to coat. Refrigerate (in airproof container) for up to 3 days. Toss to mix before serving.